Past faculty members are listed below. 2019 appointments will be made in coming months and updated here. 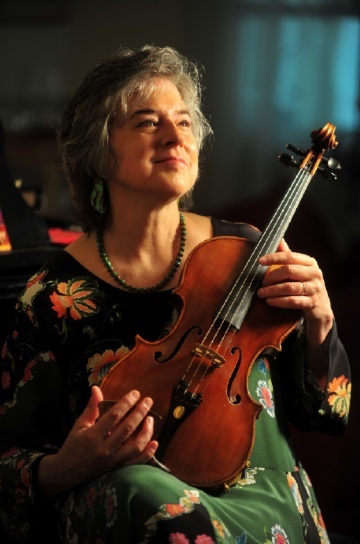 Margaret Zufall Roberts (Artistic Director, Viola) is the Founder and Artistic Director of the Chamber Music Institute of ASTA/NJ, which began in 2005 at Kean University. An active board member and past president of the NJ Chapter of the American String Teachers Association, Ms. Roberts is frequently seen on site of one of ASTA/NJ’s many projects. 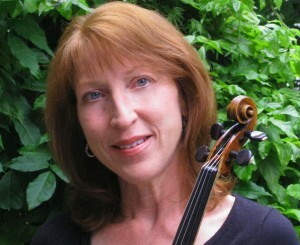 As a viola performance major, Ms. Roberts was the principal violist in the Ohio University Orchestra. After receiving her BM from Ohio University, she received an MME at Fairleigh Dickinson University and later did graduate work at California Institute of the Arts, where she was awarded a full scholarship to play in their graduate string quartet. Her teachers include Charles Ponall, Eugenie Dengel, Howard Beebe, Paul Doktor, Alan DeVeritch, and Jesse Levine. She was the principal violist of the Duluth Symphony Orchestra, and has performed at the Mozarteum in Salzberg, Austria, the Los Angeles Chamber Orchestra, and with the New Jersey Symphony Orchestra. Currently the principal violist in the Montclair Chamber Orchestra, Ms. Roberts is a frequently heard performer of chamber music in the New York/New Jersey area. She has been featured during Music Week at the historic Mohonk Mountain House with members of the New York Philharmonic, and has performed with members of the Orpheus Chamber Orchestra at Weill Recital Hall, and as a guest performer on faculty recitals at the Lebanon Valley College. Ms. Roberts teaches viola and violin in her home studio. She also coaches chamber music and sectional rehearsals for the New Jersey Youth Symphony, and the Youth Orchestras of Essex County. Having served on the Orchestra Procedures Committee for the NJ All State Orchestra for many years, she is now an adjunct faculty member at Montclair State University John J. Cali School of Music, teaching Instrumental Technique classes to all the undergraduate music education students. 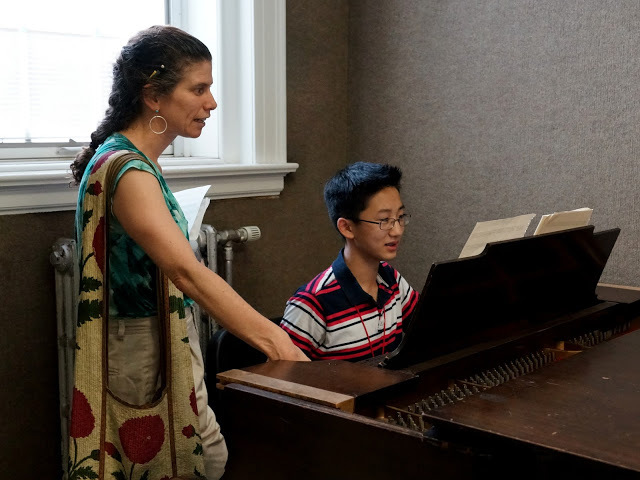 She also teaches string classes and private lessons at the Judith Wharton Music Center in Berkeley Heights, and conducts the Prelude Ensemble of the New Jersey Intergenerational Orchestra. Dr. Neil Aaronson (ASTA/NJ CMI Director, Viola) has been working for the CMI since its founding in 2005. 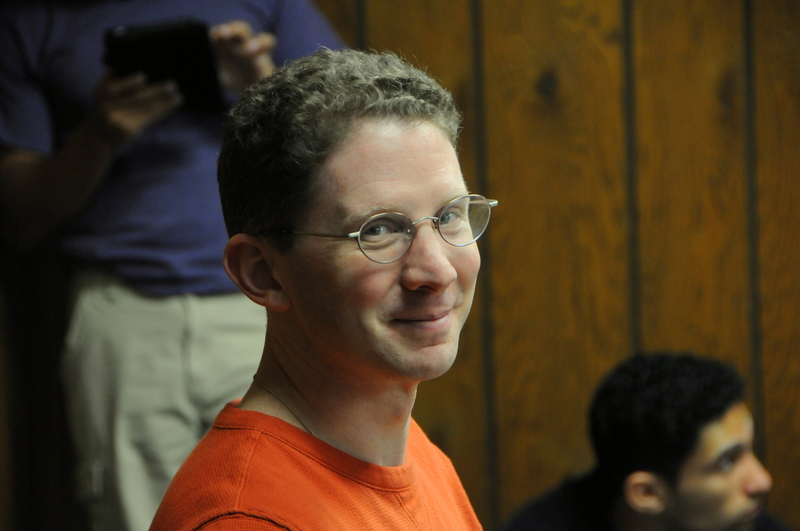 He is an active board member of the NJ chapter of the American String Teachers Association. Dr. Aaronson earned his BS in Physics from the College of New Jersey in 2002, his MS in Physics in 2004, MS in Electrical Engineering in 2006, and a Ph.D. in Physics in 2008 from Michigan State University. His research focused on psychoacoustics and sound source localization. He became a Professor of Physics at Stockton University in 2008, where he currently teaches, runs the Stockton Acoustics Lab, and is the Coordinator of the Physics Program. His research includes sound localization, music perception, room acoustics, underwater acoustics, and sound source characterization. Dr. Aaronson grew up playing the violin, eventually adding viola while in college. Upon returning to New Jersey in 2008, he joined the viola section of the Philharmonic of Southern New Jersey. He was invited to join their Board of Directors in 2011, became the Vice President in 2013, and was elected to be the President of the Board of Directors in 2015. He is also the Assistant Conductor of the Stockton Oratorio Society, and music director of Stockton’s three student a cappella ensembles, including the award-winning Stockapella. He is the Director of Music and Conductor for the Fall and Spring musical productions at his alma mater, Cherokee High School in Marlton, NJ. Born in New York City, New Jersey Symphony Orchestra Associate Concertmaster Brennan Sweet began violin studies at age 2 in Edmonton, Alberta, Canada. In 1977, he studied violin at the Franz Liszt Academy of Music in Budapest, Hungary. Beginning his college education as an engineering student at Washington University in St. Louis, Sweet transferred and earned a BM from Indiana University, eventually serving for three years as teaching assistant to Josef Gingold before joining the faculty for another two years as Lecturer. A native of Wisconsin, Mary Ann Mumm made her debut with the Milwaukee Symphony Orchestra at age 15 as the first prize recipient of their Young Artists Competition. She attended Indiana University where she studied with Josef Gingold and also served as his graduate teaching assistant. Additional influential violin teachers include Ivan Galamian, Tadeusz Wronski and Gerald Stanick. As an Assistant Professor of Violin at Northwestern University, Ms. Mumm was the youngest and first woman to be appointed to a full time faculty position in the instrumental music department. Her orchestral engagements include the Milwaukee Symphony Orchestra, Lyric Opera of Chicago, and most recently, 17 years with the MET Orchestra. Ms. Mumm has performed extensively on international radio broadcasts and television as well as recording on the Sony and Deutsche Gramophon labels. Her chamber music collaborations are numerous and include performances with some of the world’s finest orchestra, chamber and solo musicians. She is sought after for her enthusiastic teaching and dedication to string education. Ms. Mumm presently serves on the faculty of Youth Orchestra of the Americas in addition to her positions as Director of Chamber Music Program for the Youth Orchestras of Essex County and Advisory Board Chair for the ASTA/NJ Chamber Music Institute. During Ms. Mumm’s tenure as the 2006-08 President of the American String Teachers Association-New Jersey Chapter, the state was recognized for its excellence with an unprecedented five national awards. 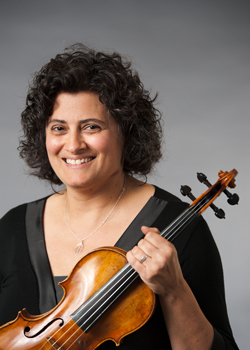 A native of Westchester County, New York, violinist Naomi Youngstein attended the Manhattan School of Music Pre-College Division and later received a BM and MM in violin performance from the Manhattan School of Music. As a student of Burton Kaplan, Youngstein won the school’s concerto competition and the Ravel Academie competition, for which she was awarded a trip to France to attend master classes at the Ravel Academie. While a student at MSM, she performed with the school’s orchestra (as concertmaster) and the Manhattan Contemporary Ensemble. Youngstein attended the National Repertory Orchestra festival for two seasons; in her second season with the ensemble, she was assistant concertmaster and performed a concerto with the orchestra. She has taught at the Thurnauer School of Music of the Jewish Community Center in Tenafly, NJ and at Rutgers Prep School. She has also coached for the New Jersey Youth Symphony. For three years she has been a chamber music coach at the American String Teachers Association (ASTA) summer Chamber Music Institute, and she is the current treasurer of ASTA NJ. She teaches violin privately at her home studio and is a member of the Amaryllis Ensemble. 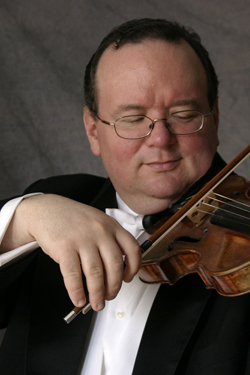 Craig Mumm is the associate principal violist of the Metropolitan Opera Orchestra of New York. He is also a frequent guest artist on the Carnegie Hall concert series of the MET Chamber Ensemble and the New York Chamber Music Festival at Symphony Space. Mumm has recorded extensively on the Deutsche Grammaphon, Sony, Naxos, and Decca labels. His 2011 Grammy®-nominated, world-premiere recording of Franco Alfano’s Piano Quintet was praised in The Strad magazine. Mumm can be heard weekly on the famous MET Opera international radio broadcasts and in theaters for performances of The MET: Live in HD. Mumm regularly teaches master classes at music schools including the Manhattan School of Music and the Boston Conservatory. As an active member of the American String Teachers Association, he has been a juror for solo competitions as well as featured presenter at the national ASTA convention. He is a faculty member of the Youth Orchestra of the Americas and has taught master classes in Caracas at the music center of “El Sistema.” Recent teaching, solo and chamber music performances include residencies at Instituto Superior de Música Estado de Veracruz in Esperanza Azteca-Puebla, Mexico; Filarmónica Joven de Colombia; ASM Music Festival in Panamá; and the Festival de Música de Santa Catarina, Brazil. Cellist Mira Kang has had a versatile career as a soloist, chamber musician, and teacher. She made her debut at the age of 16 as a soloist with the Seoul Philharmonic Orchestra, one of the most prominent orchestras in her native country, Korea. She was also invited to perform in the Seoul International Music Festival and has been featured on live radio and MBC television broadcasts in performances with the Seoul Philharmonic Orchestra. Kang has performed throughout South Korea, the Northeastern US, and Germany as a recitalist and chamber musician. Currently a New Jersey resident, she has performed in Carnegie Weill Recital Hall, Merkin Hall, Borden Auditorium, the Miller Theater at Columbia University, and the Arts Council of Princeton. Mira Kang is a member of the piano trio group, TRIDENT, formed with faculty members of the Extension Division at Mason Gross School of the Arts at Rutgers University. She participated in the recent recording of “Franzetti Plays Franzetti” on Amapola Records with TRIDENT.Both a performer and a passionate educator, Kang has been invited to music festivals such as Northern Lights Festival and ASTA/Chamber Music Institute to serve in both capacities. Her passion for chamber music and music education led her to form and direct a string chamber ensemble group, Veritas, whose members consist of highly achieving teenage string players. In addition to her busy private studio, Kang currently teaches at Young Artist Program of Mason Gross School of Arts at Rutgers University. She also serves as adjudicator for numerous competitions and auditions such as National League Performing Arts’ competition series and NJMTA auditions. Susannah Chapman is well-established as a chamber musician, soloist, contemporary music interpreter, and performer in leading chamber orchestras. The principal cellist of the Mostly Mozart Festival Orchestra, she is a former member of the Saint Paul Chamber Orchestra and currently performs regularly with the Orpheus Chamber Orchestra. In past seasons with Orpheus she has toured Southeast Asia, Europe, South America, Japan, appeared in Carnegie Hall, and performed on their European chamber music tour. 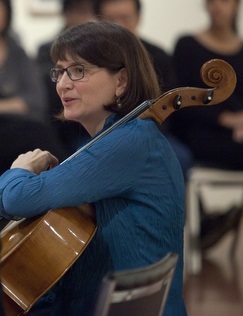 Premiering new works by many of America’s leading composers, Ms. Chapman has performed with the Bang-on-a-Can All-Stars, the cello quartet “Cello”, and is a member of Cygnus, a contemporary music sextet with its own series at Merkin Hall, and residencies at both Sarah Lawrence College and City University of New York. Ms. Chapman has appeared at Jacob’s Pillow as a soloist with the Mark Morris Dance Company in works designed for and premiered by Yo-Yo Ma. She has traveled to Australia with Bang-on-a-Can All-Stars to perform contemporary concertos in the Sydney Opera House as part of the Olympic Arts Festival. Ms. Chapman is a founding member of the string trio Trigon and spent several summers at the Marlboro Music Festival, performing with such artists as Midori, Samuel Rhodes, and Isidore Cohen. With Musicians from Marlboro, she has toured nationally. She regularly performs a gives masterclasses with The Walden Chamber Players, and her chamber music performances with other New York groups have been heard at the 92nd Street Y, Weill Recital Hall, Merkin Hall, the Metropolitan Museum on NHK Television and on WNYC. Ms. Chapman holds a DMA from Stony Brook University and is the cello instructor at Sarah Lawrence College. A native of Maplewood New Jersey, Terrence Thornhill graduated from the Cali School of Music in 2011 with a BM in Music Education. He served as student representative on the board of trustees and principle cellist of the Montclair State Symphony Orchestra. He studied cello with Nicholas Tzavaras, String Coordinator at the John J. Cali School of Music and Cellist of the Shanghai String Quartet. He has participated in masterclasses with Yo-Yo Ma, Carter Brey principle Cellist of the New York Philharmonic, Peter Wiley cellist of the Beux Arts Trio and Gueneri String Quartet, members of the Shanghai, Emerson, JACK, Borromeo and Daedalus, and Colorado String Quartets. As an educator, Thornhill maintains a diverse private studio in the New York Metro Area, teaching students from kindergarten to adults. 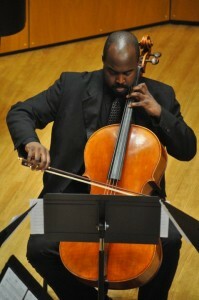 In addition to his private studio, Terrence is on the Faculty of the Montclair State University’s Preparatory Division where he teaches Cello, Music Theory and is the head of the Chamber Music department. In 2007, Thornhill served on the board of the Montclair State University Student Chapter of American String Teachers Association which won best student chapter in the country. On a state-wide level, Thornhill was chosen to administer sectionals for the New Jersey Region and All-State Cello section in 2008 and 2009. In 2009, Thornhill received the Allen Iverson Music Education Award, the highest award given by the John J. Cali School of Music to an undergraduate music education major. Thornhill is currently a graduate student at SUNY Purchase, studying cello with Julia Lichten. He also currently studies conducting with Ken Lam, director of orchestras at the John J. Cali School of Music at Montclair State University. Linda McKnight was recently recognized for her 37 years of service as a faculty member at the Manhattan School of Music, where she taught since 1979 in the Precollege Division, and since 1987 in the College Division. In 1987, she also began teaching at the John J. Cali School of Music at Montclair State University in her home state of New Jersey, where she resides with fellow bassist, husband Jay VandeKopple. Linda McKnight was introduced to the double bass in 9th grade at middle school (then encompassing grades 7-9) by Warren Grim, the instrumental music teacher, and began private lessons with Joseph Cascelli, principal bass of the North Jersey Philharmonic Orchestra. She earned a BM from The Juilliard School in 1968 under Frederick Zimmermann of the New York Philharmonic, and Stuart Sankey; and pursued additional studies with Henry Portnoi, Warren Benfield, and Homer Mensch. McKnight has performed extensively in orchestras throughout the New York/New Jersey area including over 30 years with the Cecilia Chorus at Carnegie Hall. She has given educational workshops and clinics from Maine to California, and has presented masterclasses for the American String Teachers Association, International Society of Bassists, Oklahoma Summer Arts Institute, and the 2004 World Bass Festival in Wroclaw, Poland. Her former students have gone on to win prizes and competitions, and currently occupy principal bass positions in a number of orchestras in the United States and internationally. She is published in String Tones, Tempo, American String Teacher, and Bass World magazines, and edited Paul Ramsier’s “Pieces for Friends,” published by Boosey & Hawkes. 2014 Latin Grammy® Nominee for Best Classical Album and 2008 Grammy® Nominee for Best Instrumental Soloist without Orchestra, pianist Allison Brewster Franzetti (Piano) has received international acclaim from critics and audiences alike for her stunning virtuosity and musicality, both as a soloist and chamber musician. Her latest CD, “Franzetti Plays Franzetti,” was released on Amapola Records. This new recording features solo piano and chamber music by Carlos Franzetti. Naxos Records released a complete boxed set of “Mieczyslaw Weinberg – Complete Piano Works” in January 2015. An accomplished collaborative pianist, she has worked with Sir James Galway, John Corigliano, Stephen Paulus, Carlos Franzetti, Lowell Liebermann, Robert Aldridge, David Maslanka, Ransom Wilson, Robert White, Eugenia Zukerman, and Julius Baker, amongst others. 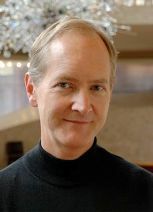 Dr. Brewster Franzetti is the recipient of degrees from Manhattan School of Music, the Juilliard School and Mason Gross School of the Arts at Rutgers University. She is currently Artistic Director of the Young Artist Program and Director of Chamber Music for the Extension Division, Mason Gross School of the Arts. Amanda Harberg’s (Composition) recent commissions include orchestral works for the Grand Rapids Symphony and the New Jersey Youth Symphony, Venus Unhinged by the Albany Symphony and David Alan Miller, Feathers and Wax for flutist Julietta Curenton’s debut with the Philadelphia Chamber Music Society, Concerto for Viola and Orchestra, commissioned by violist Brett Deubner, Of Earth and Air by the University of Nevada Reno Symphony Orchestra, and and a new piece for pipe organ by Helen Hofmeister Hawley and the Westminster Presbyterian Church in Grand Rapids. Harberg has recordings out on Koch International, Albany Records, Centaur Records, Walking Frog Records and upcoming recordings on American Modern Ensemble Records. Her educational band and piano music is published by C.L. Barnhouse and by Createspace. 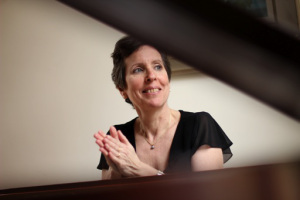 She has taught at Juilliard, Interlochen, the Luzerne Music Center and the ASTA Chamber Music Institute, as well as maintaining an active private teaching studio since 1997. Harberg received her BM and MM from the Juilliard School where she studied with Stephen Albert, Robert Beaser and David Diamond, and where she was awarded the Peter Mennin Prize for outstanding accomplishment. Harberg lives in Glen Ridge, NJ with her husband, Micah Fink and their two children, Lucas and Sydney.